In this week's episode David, John and Kyle discuss networks intentionally misspelling show titles to effect Nielsen ratings (2:30), mother!’s split reviews and how that is effecting the movie’s marketing (9:10), why Burger King wants the It movie to be banned in Russia (18:20) and the announcement of a Nurse Ratched spinoff show (23:15). 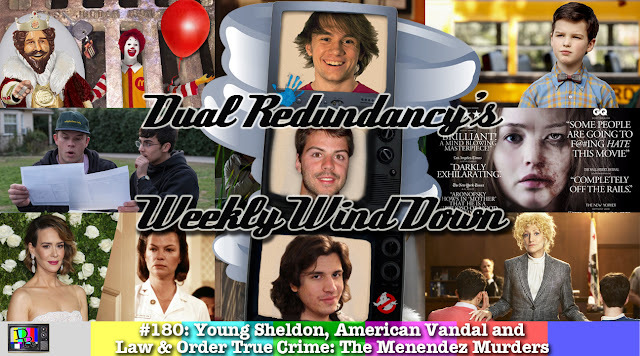 We also review the series premieres of Young Sheldon (30:00), American Vandal (40:35) and Law & Order True Crime: The Menendez Murders (50:40). 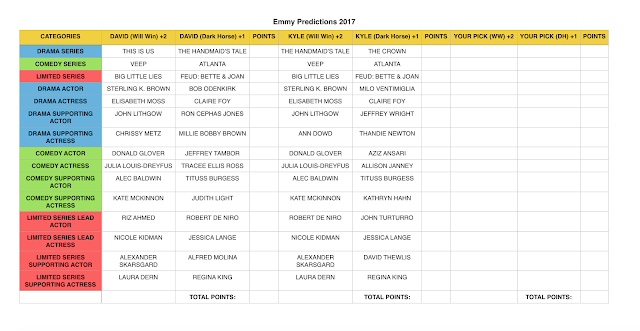 In this week's episode Dave, John and Kyle discuss the 69th Primetime Emmy Awards and who won the Emmy prediction bet (2:15). 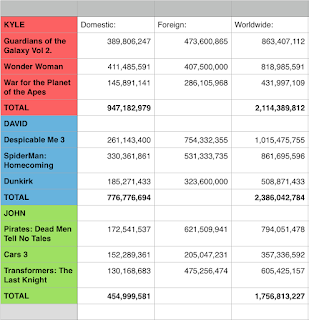 We then look at the results of our second annual summer movie draft (23:10). 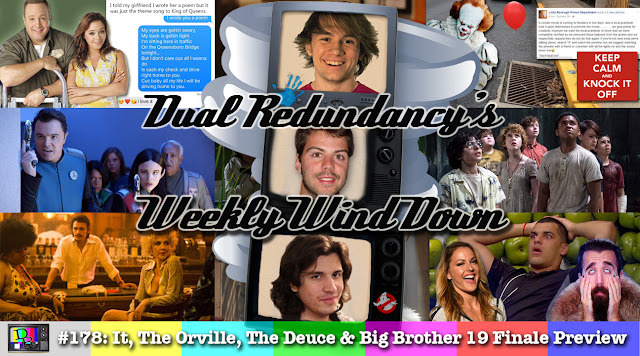 Finally, we react to the Big Brother 19 finale (39:30). 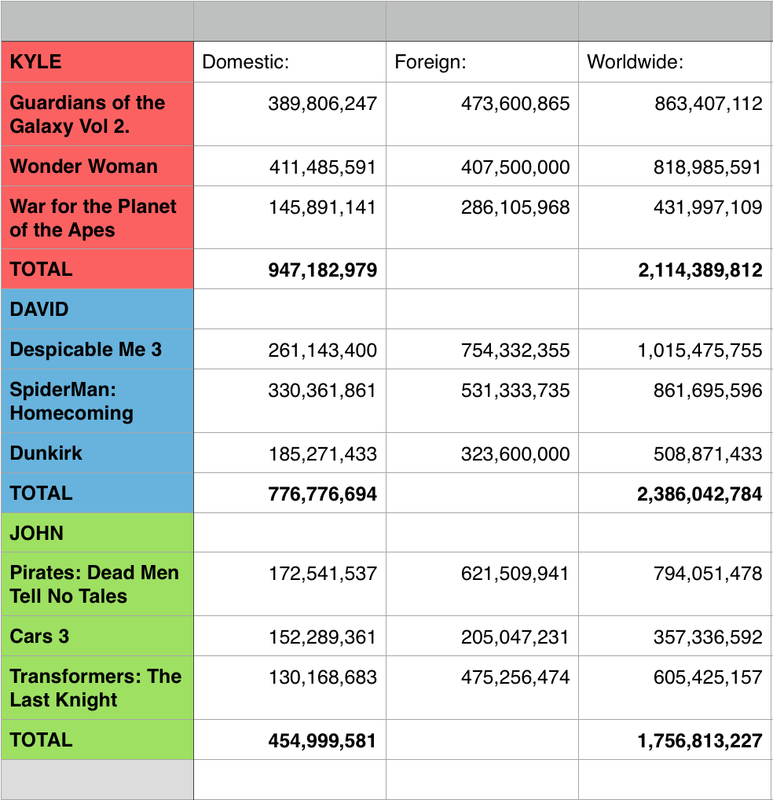 Below are the totals for our second annual summer box office draft through September 18th 2017 (according to Box Office Mojo). To listen to the draft check out episode 165. In this week's episode David, John and Kyle discuss why men are texting The King of Queens theme song to their girlfriends (1:55) and how one police department is unhappy with It movie tributes (7:50). We also review the movie It, which is based on the Stephen King novel (12:35). We also review the series premieres of both The Orville (23:35) and The Deuce (34:00). Finally, we check in on Big Brother 19 less than a week before the finale (43:55). 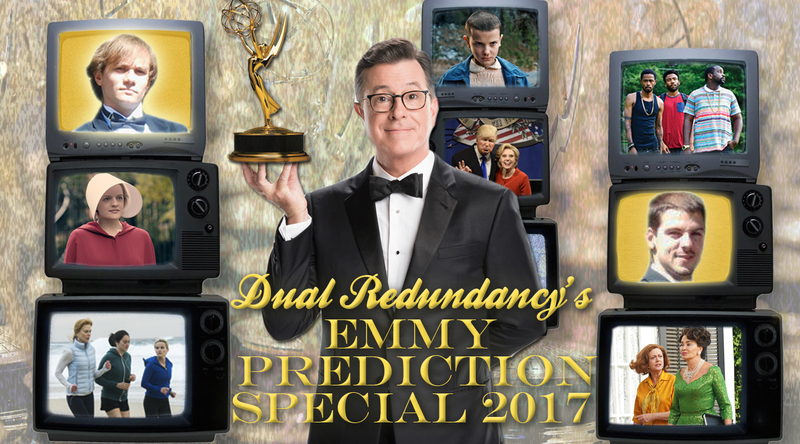 Every year we try to predict the very unpredictable Emmys in a very special episode of Dual Redundancy. This year Dave and Kyle try and forecast who will take home the Emmy in all the major categories for the 69th Primetime Emmy Awards. The ceremony will be on Sunday, September 17th on CBS and will be hosted by Stephen Colbert. We first discuss how Stephen will do (2:25), a rescinded nomination (4:25) and overall nomination stats (5:55). 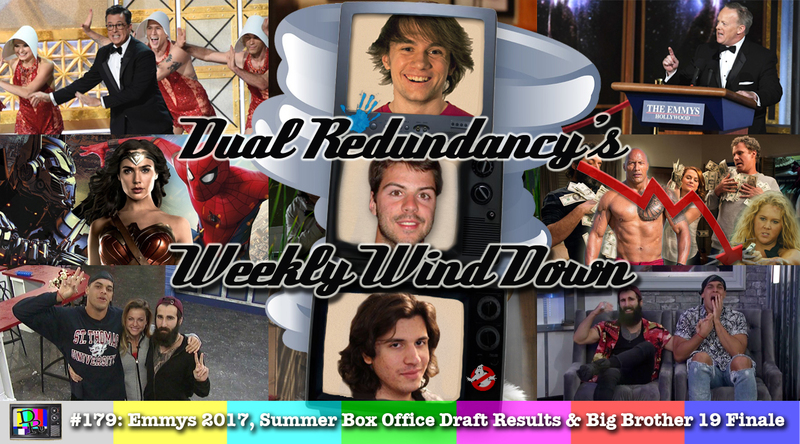 We then predict the limited series performances (9:40), the comedy performances (26:05) and the drama performances (42:15). 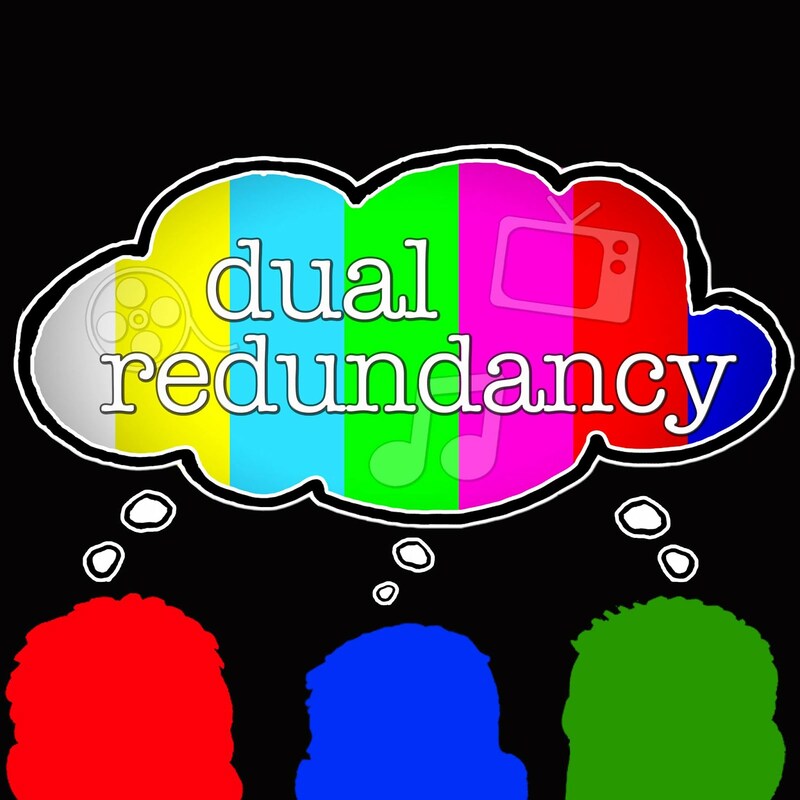 Finally, we look at the main three: limited series, comedy series and drama series (58:15).